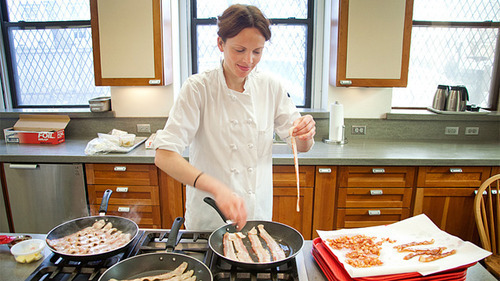 In the test kitchen, we appreciate the beauty of bacon with a crispy and tender bite, rather than its being burned to a crisp. What innovative method ensures this perfect texture? 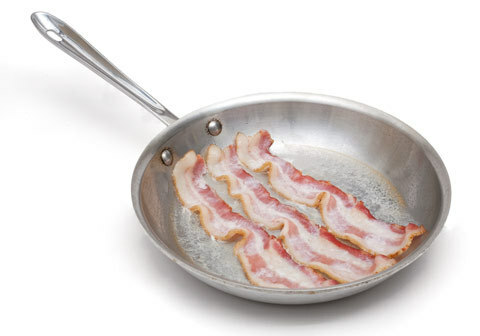 We cook the bacon in water in a skillet. When I stand in the aisle of the grocery store looking for canned beans, I always see the usual suspects: kidney beans, red beans, pinto beans, black beans, navy beans, and garbanzo beans. Based on a study by the Can Manufacturers Institute, Americans consume more than five cans of fruits and vegetables in an average week, so naturally, these legumes are always top of mind in the legume consideration set. Let me preface this post by saying: I love all legumes and do not discriminate. Canned garbanzo beans have saved me on many quick-meal nights (great add for vegetable curries), and I will never refuse a bowl of Boston baked beans. Unfortunately, I feel that there are a lot of foods, though they may be foreign or do not come in a can, that deserve to be in an American consumer’s consideration set… like the fava bean! Also known as “broad beans,” these legumes are popular in Mediterranean and South American cuisines and are high in plant protein like other legumes. They are also full of nutrients including vitamin B, iron, and manganese. Interestingly, these little beans also contain L-dopa, which is a pre-cursor amino acid in producing dopamine in your brain, making you feel happy! As with anything beneficial or rewarding, there is always some work involved. These little nuggets take some time to prepare because I have never seen them in a can, but I could be wrong. Fava beans come in long green pods and need to be shelled twice to get to the good stuff. Only the beans inside the long pods are edible, so it’s unfortunate that these beans are purchased by the pound and most of the pod gets discarded (we do live in a capitalist country…). Pick green pods that are full, firm, and bright green. This indicates that the beans inside are ripe and full. As I mentioned before, fava beans require two shellings. Open the outer green pod and set the beans aside. I find that the easiest way to open the whole pod in one fell swoop is by pinching the top stem and pulling the seam down the middle of the pod. Or if you’re not always about perfection, efficiency, or want to get messy (this is a great kid’s activity), I also like to stick my fingers through the spongy pod and pop them out one-by-one. The light green shells (the ectoderm) also need to be removed. Steam or blanche the beans, and once they are cool enough to be touched, remove the light green outer shell as shown below. If the beans are not tender yet, you can cook them a little longer, steam, blanche, incorporate into a dish… but there you have it, your fava beans are ready to be eaten! What I love most about fava beans is their creaminess. Mash them up, add some tahini, olive oil, garlic, and lemon, and you’ve made yourself some delicious fava bean hummus. Add them to a stir fry, salad, or pasta and it will give your dish an added layer of texture. My favorite way to cook fava beans is with a little bit of bacon or pancetta. Because of the fava beans’ creamy texture, I like to pair it with a little bit of crunch, and crispy pork does just that. On that particular day, I used the fava beans and bacon in a curried couscous appetizer, which incorporated texture and flavor to create a well-rounded and dynamic dish. My guests thoroughly enjoyed it and thought it was the best dish of the night! The average diner may run into the fava bean once in a while at a high-end restaurant from a tasting menu, but that is not enough exposure to bring the bean mainstream and in to kitchens. Fava beans are so delicious and deserve to be in the spotlight more often, especially since they’re so nutritious! I encourage you to take the time to explore your local grocery store and buy something you haven’t seen before (maybe even some fava beans!). With the internet, you can learn almost everything and anything about an ingredient. I wholeheartedly hope that one day, the fava bean will gain enough fame to rival the pinto bean and have a place on the bean aisle. Until then, I will continue to be its ambassador and cook them more often in my kitchen! Are there ingredients you wished more consumers knew about or enjoyed?